This recipe is based on the wonderful ‘pasta al forno’ (pasta bake) my Sicilian mother-in-law makes! In fact, she brought a dish (actually two) over to our house last Easter Sunday. We had 22 people for lunch which was quite a challenge but the great thing about Italian families is they are always happy to contribute towards the cooking and food, so it’s rare for the hosts to end up doing everything. Dessert is a very traditional offering and we actually ended up with 5 different cakes made by various guests and family members! Plus this wonderful pasta al forno! 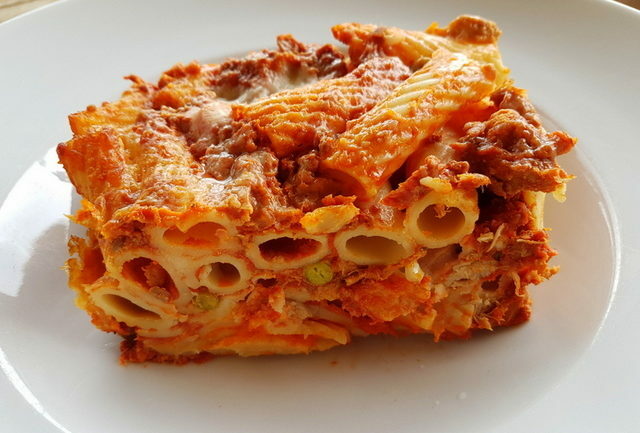 If we include vegetarian dishes, there are hundreds of different recipes for baked pasta, pasta al forno, here in Italy. But, the most traditional and classic is with a meat sauce or ‘ragu’, a tube pasta type such as macaroni (in Italian ‘maccheroni’). rigatoni, tortiglioni, elicoidali, penne etc and some local soft or semi soft cheese as well as parmesan, pecorino or grana sprinkled on top. Pasta al Forno, perfect for Sunday lunch! ‘Pasta al forno’ is a popular dish in Italy on Sundays or public holidays, especially in the South. This is probably because it takes longer to make than recipes with pasta which has only been boiled, so it is too time consuming for a week day meal. However, it can be made mostly in advance and is ideal for feeding a large number of people. Needless to say, there are always plenty of guests at an Italian family Sunday or holiday lunch! Kids also love it and a beautifully baked ‘pasta al forno’ looks so great when brought to the table! Normally in Italy, pasta is not the main course. It is the ‘primo’ or first course and is often followed by meat or fish with vegetables and sometimes potatoes, although Italians aren’t big potato eaters unlike the Germans or the Brits! For this reason, pasta is often served with a lighter sauce, but on special occasions when families get together baked pasta is a popular tradition. Housewives and cooks in each Italian region have a slightly different way of making ‘ragu’(meat sauce). 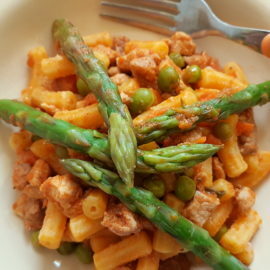 However, the basic ingredients are much the same; two or three types of meat, ground or cut into small pieces (often pork and beef or veal), fresh tomatoes or passata, carrots, celery and onions, stock and wine. The rest of the ingredients vary from region to region and sometimes from cook to cook. Some add other vegetables, spices, herbs and Bolognese, for example, is made with milk. 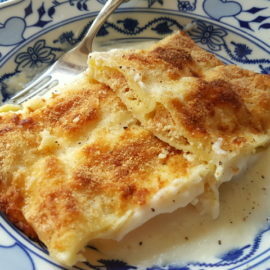 In some regions, they also add hard boiled eggs and many add homemade bechamel sauce to the dish. Not every pasta al forno includes a soft cheese, but most do. The most commonly used is mozzarella but scamorza, caciocavallo or provola are popular too. 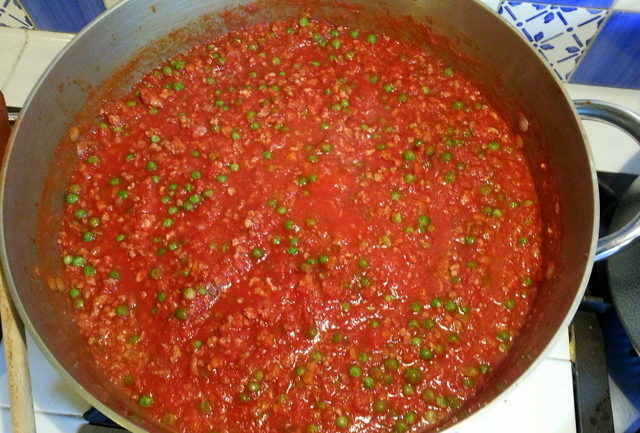 This al forno recipe (see the next page) is made with ragu from Sicily , which includes peas. The cheese is caciocavallo and the pasta, tortiglioni . It was yummilicious and despite the number sitting down to lunch that day, there was quite a bit left over so I was able to enjoy it the next day too! 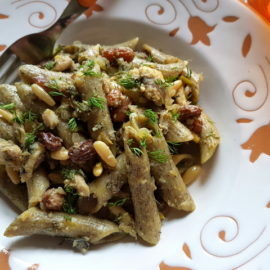 If you have never made pasta al forno, do give it a try. It’s a wonderful go-to dish when you are planning to feed a large number. I’d love to hear from any of you who make this recipe, so feel free to comment here on the blog or on the Pasta Project Facebook page! 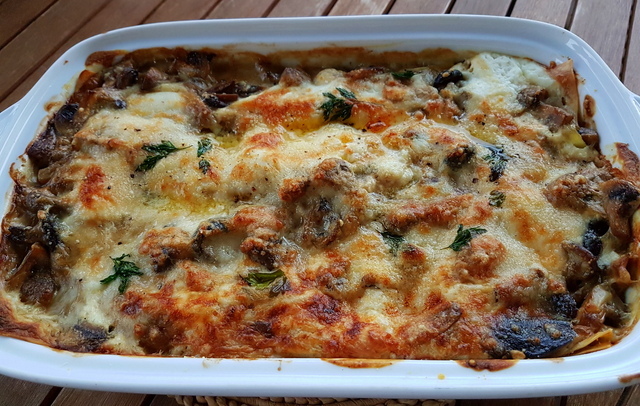 If you’d like to make a vegetarian pasta al forno take a look at the recipe for baked lasagna alla Norma or baked pasta with burrata and mushrooms. Both are really delicious! I am cooking pasta al forno (baked the Italian way) for dinner today and in the recipe it says to chop the garlic. There is no mention of garlic in the ingredients so how much garlic do I put in please? Hi Linda, thanks for pointing that out. I will correct it immediately! 1-2 cloves is what I sometimes use, depending on how big they are. If you like a more garlicky flavour you can add more. But garlic isn’t always used in ragu so you can also leave it out. OMG i feel like i could eat this all day. it sounds just amazing. 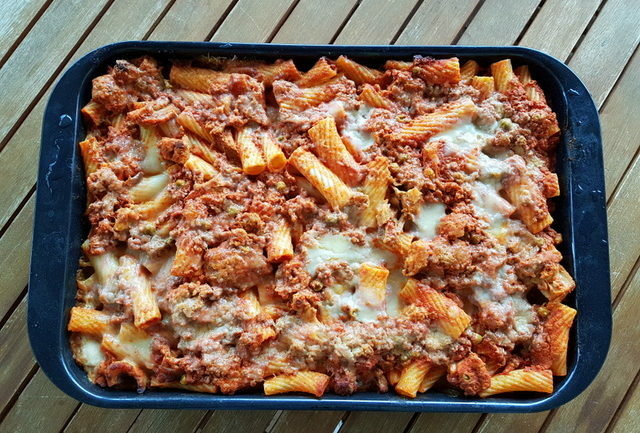 baked pasta dishes like this are the best! Thank you dear Danielle! Baked pasta is definitely one of my favourites, especially when made with a meat ragu like this one. I could also eat it all day! This looks absolutely delicious! I haven’t had a gorgeous pasta bake like this since I was a child. I love the fact that there are so many varieties of ragu too, with everyone giving it their own flare. Grazie Gabby! Yes this baked pasta is a real winner and classic Italian family fare! I want to make some of the other regional versions this coming winter! Now it’s a bit too hot to have the oven on! Wow! 22 people?! Great thing you had help. The pasta looks great. Always love seeing how people around the world cook their pastas. Thanks for sharing the recipe! Hi Mirlene, yep Italian family lunches often involve a lot of people!! My hubby has 4 sisters, all married with kids. So you can imagine how chaotic it gets! But so much fun and everybody mucks in! This looks so delicious and I love that it’s filled with veggies. I’d love to make this one day for Sunday supper! Thank you April! happy that you like this baked pasta! In reality you can put even more veggies in, although this is the traditional Sicilian way! All the best! Yum! This looks super flavorful and delicious. I love a good richly flavored pasta sauce and red sauce with pasta covered in cheese. Yes, Samantha! this definitely has all the ingredients that make baked pasta so good! It’s one of my favourite recipes for family lunches! This certainly sounds delicious. I’m definitely making this the next time I have to feed a large amount of people. Thanks Sondria, I’m sure it will go down a treat with your guests! Everybody loves a tasty baked pasta! These are the food I cried seeing since I went on a tomato free diet. I do love pasta with red sauce and i make it often for my kids. This recipe is the bomb! Grazie Armelle! Baked pasta can also be made without tomatoes. Italians say ‘bianco’ check out my recipe for baked pasta roses! Your kids will love it too, I’m sure! We just got back from Italy and had to entertain three times, which is a challenge in a kitchen you’re not used to. What’s worse we had to compete with the great cooking they’re used to getting. The solution can also be your answer to a non red pasta. Try a sauce with dried Porcini mushrooms. Add bechamelle sauce which can be made with broth instead of milk if someone is lacto intolrant. We made lasagna, but it’s the same for pasta al forno. Mozzarella is not traditionally used in Italian lasagna, just some grated hard cheese like parmiggiano. Of course you can sauté fresh mushrooms if you don’t have dried porcini. We always bring back dried porcini. By the way, after our first guests dubbed my wife the “principles said die porcini” we repeated two more times. This sauce is great for just pasta as well. Thanks for your comment Franco! Your porcini sauce sounds delicious. Porcini and pasta is a match made in foodie heaven! I love porcini, especially fresh! I’ve never made béchamel without milk. Have to try that! It’s true that Italians don’t usually use mozzarella in lasagna, but some baked pasta dishes, particularly from Southern Italy do have mozzarella. What a great dish to make for Sunday dinner, the perfect dish to bring the family together around the dinner table. Thanks Alexis! Yes this is perfect for family meals! It’s easy to understand why it’s such a classic family meal dish here in Italy! This looks like a great pasta dish! Perfect for gatherings. I like that Italians bring their own food to make it easier for the host, I wish we had the same tradition among Russians 🙂 Thanks for sharing! Thank you! Yes, I love this Italian tradition. The only problem with it is that sometimes you end up with too much food!!!! Grazie Tina, I’m happy you like this recipe! 22 is quite normal in my house, especially for family occasions. My hubby has 4 married sisters with kids, so you can imagine how chaotic family events become. But it’s lots of fun and everybody helps! This looks so authentic and inviting. I love pasta, but sadly I’m on a keto diet at the moment so I’m having to avoid it. Shame – I would LOVE to try out your recipe. Maybe another time! That’s a pity Kacie, although you can find some low carb pasta alternatives. I’ve read almond flour or bean pasta are popular substitutes, although I haven’t tried them myself! It would be interesting to know how either would taste in a baked pasta. I am such a fan of your pasta recipes. This sounds like another winner. Aww thanks so much Jere! This is a great recipe for feeding large numbers and for family meals! A real classic here in Italy! When I was a child, my mom made some baked spaghetti. This reminds me of that. I love baking pasta casseroles. This is a great and delicious way to feed a crowd. Baked spaghetti sounds good Gloria! Yes baked pasta is a winner when it comes to feeding a large number! Grazie Edyta, am thrilled you love this recipe and want to make it! You won’t be disappointed! I am drooling over here! Recently I have become somewhat obsessed with traditional Italian recipes (not that I have any Italian in my family whatsoever), and I love how you broke down different regions and styles. So incredibly helpful. My husband is going to LOVE this pasta! Thanks so much Rae, I’m happy you liked the recipe and the information in the post. Pasta is such a major player in Italian cuisine but it’s made and prepared in different ways from region to region! I love these variations! This recipe is going in my winter rotation. I am always looking for yummy recipes that my family will love that can be ready after a long day. Looks wonderful. Thanks so much Ali! Pasta baked this way or similarly is a popular family meal recipe throughout Italy. I’m sure your family will love it too!! Kids love pasta! This is a recipe everyone needs to try (kids or not) because I know it is going to be delicious! I agree Kristina, this is a recipe both young and old will love. It’s certainly loved by kids and adults alike here in Italy! I can make this on a Sunday and eat it the rest of the week for lunch, thanks for the inspiration! You certainly can Michelle! I do it often. Sometimes I just heat the leftovers in the microwave or oven. It keeps well in the fridge for 2-4 days! Other times I make more than one dish, so that I can bake the second one a day or two later! Oh my heavens that looks amazing!!! I love how dense and filling that looks. Absolute comfort food! Comfort food perfection Constance. I guess that’s why baked pasta is so popular with Italian families! This looks delicious and perfect for a weeknight dinner! Putting it on the must-try list! Thanks so much Kelly! I’m happy you want to try this classic Italian dish! I’m absolutely sure you’ll love it! Baked pasta dishes are my favorite! Definitely bookmarking your page for more ideas! Thanks Micky! I love baked pasta too and there are many ways to make it. This one is a classic loved by kids and adults alike! This looks really good, and I loved to read about the different varieties of ragu in different regions! And Italian families sound awesome. 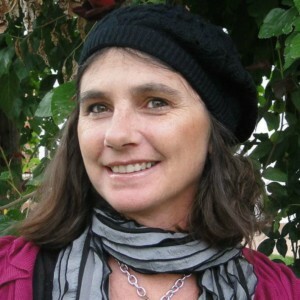 Grazie cara Stine Mari! Yes it’s interesting that ragu recipes vary from region to region here in Italy, sometimes even from town to town. 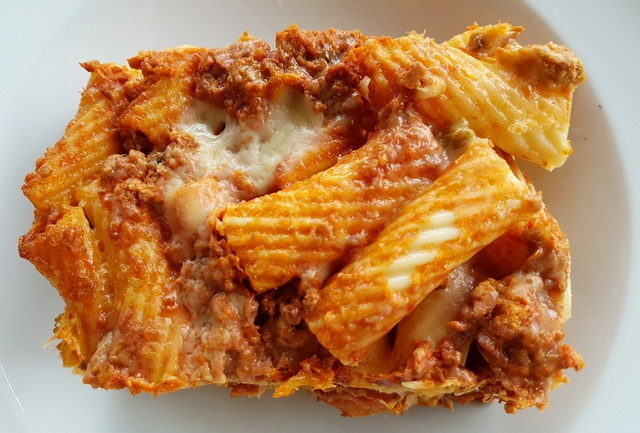 Baked pasta with ragu is really a classic enjoyed by young and old here! I love the idea of making this in advance and feeding a crowd. It just looks so good! I think I know what to have for dinner tomorrow now too! 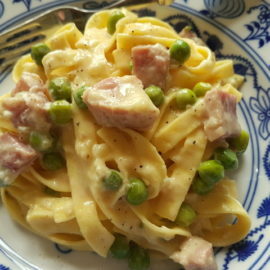 Creamy pasta is always my favorite and drooling every time I see it, that’s why I have a Pasta List. I must try this and I hope I found all the ingredient on the market.